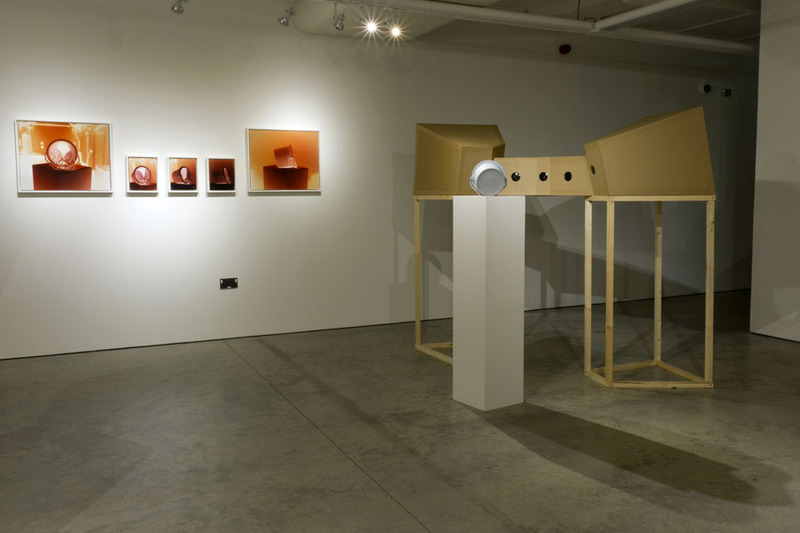 Material Matters was first commissioned by Gerald Moore Gallery, London. From 23 November 2013 to 1st February 2014. 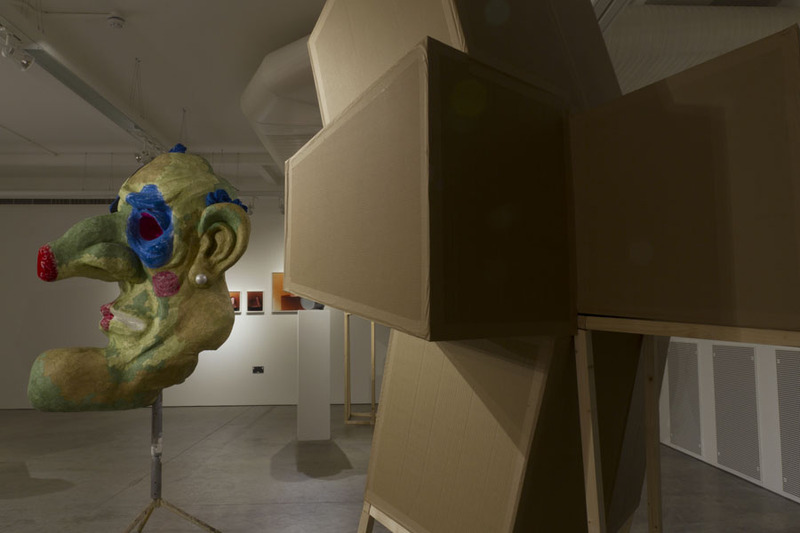 For Material Matters Martin Newth selected sculptural works by three artists: Katie Cuddon, Matt Franks and Nick Pearson. 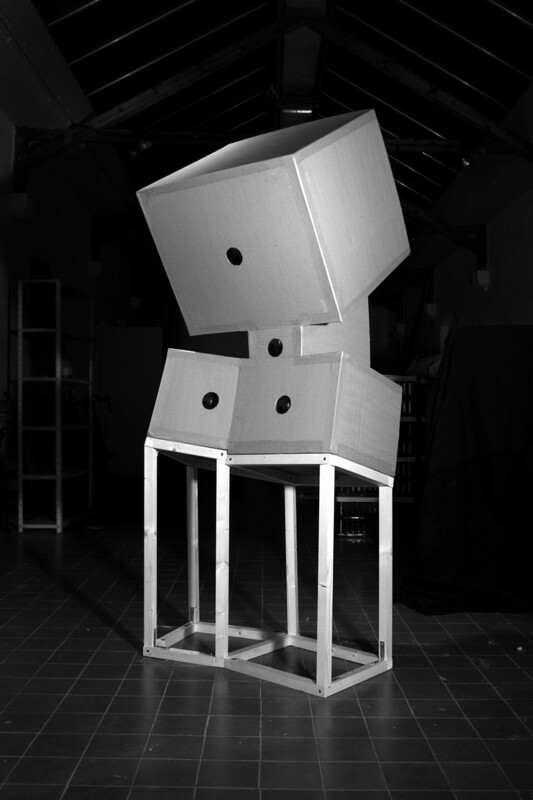 For each of the selected sculptures Newth built a cardboard camera that was made to exclusively photograph each work. The size and shape of the camera is unique to the sculpture it is designed to photograph, and corresponds specifically to each work's characteristics and dimensions. 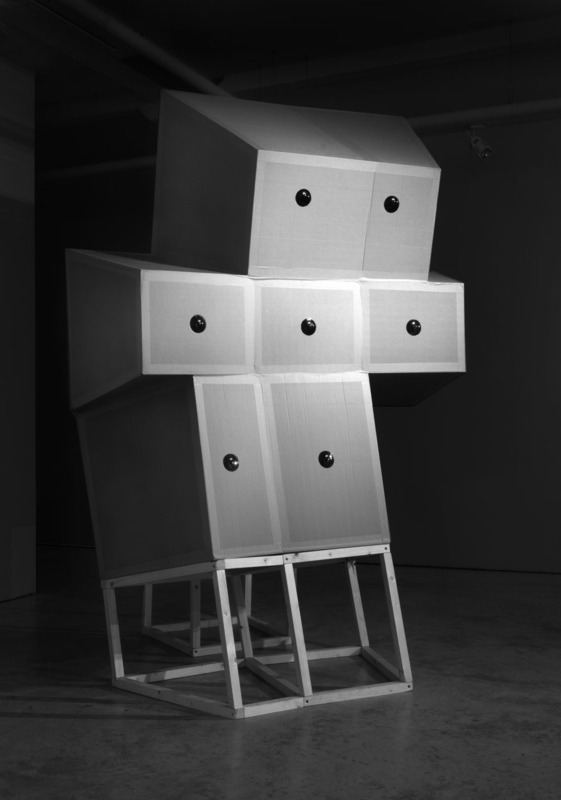 The cameras become sculptures themselves that often resemble architectural models or strange, anthropomorphic beings. Using lo-fi analogue technology the multi-lens, cardboard cameras are used to make photographic images. 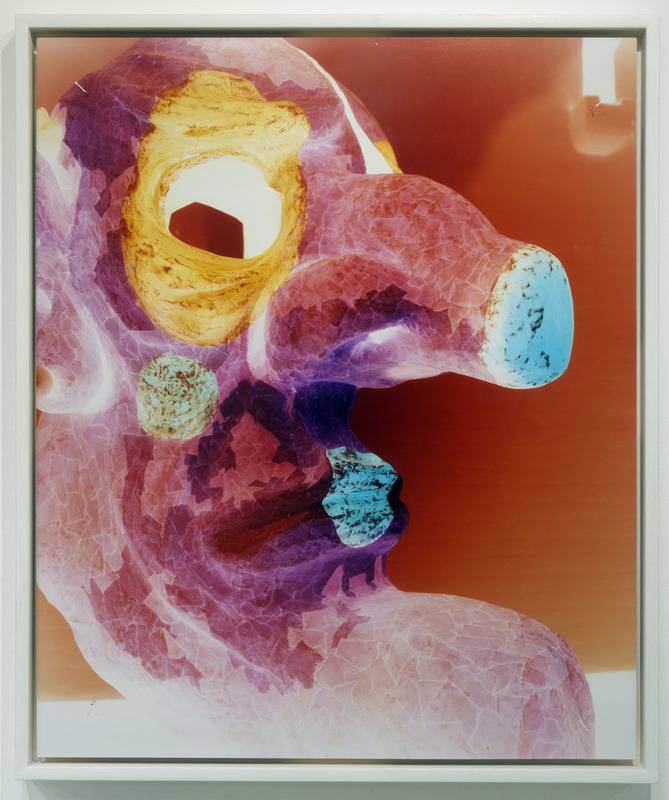 These photographs emphasise the materiality of the sculptures as well as the material nature of the photographic process. 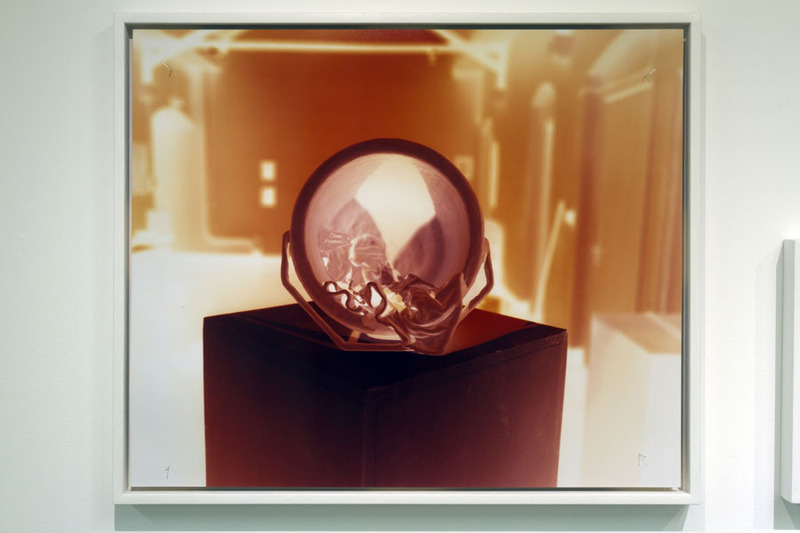 A dialogue is set up between all three elements of the exhibition: the photographic image, the camera and the sculpture. 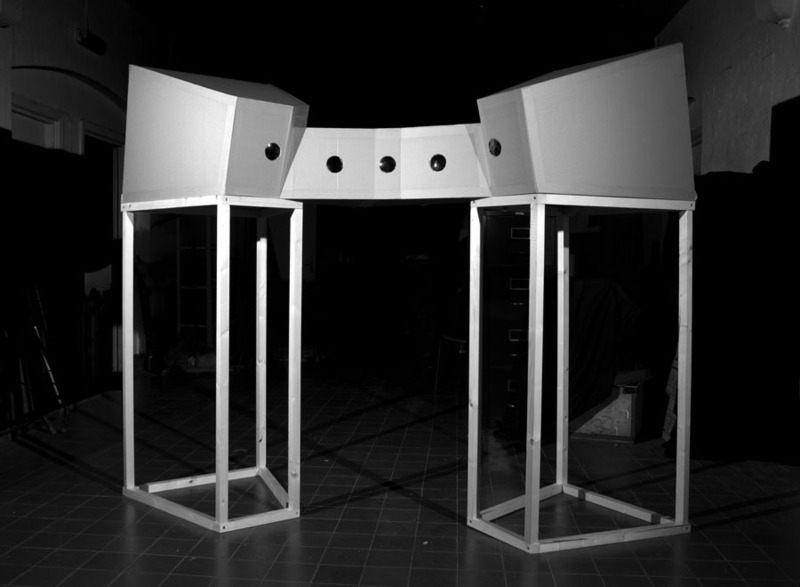 The multi-lens cameras are constructed using cardboard and stuck together with glue and tape. Uncut spectacle lenses form the lenses of the cameras. Chosen for their specific focal lengths the lenses correspond to the size and shape of the cardboard body of the cameras. 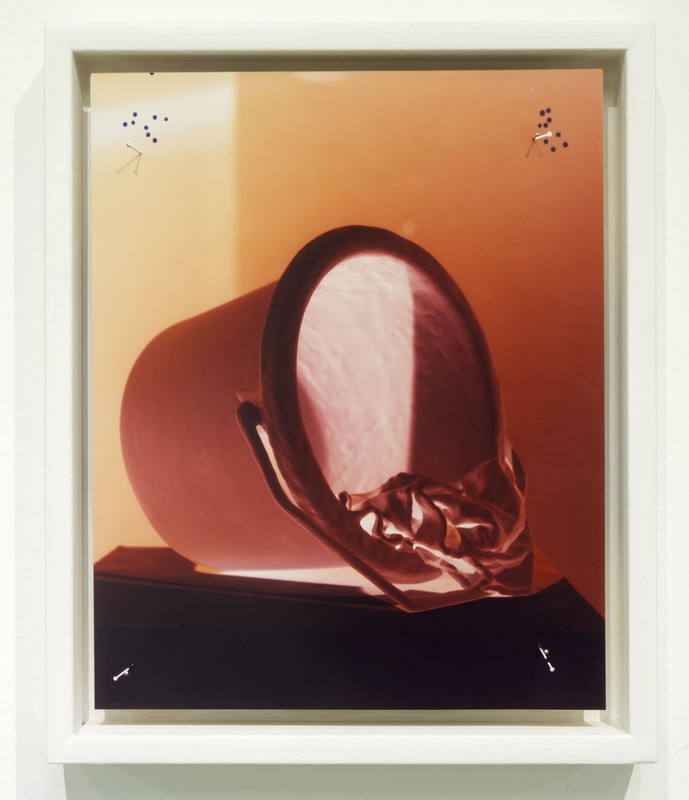 The photographs are made by pinning c-type photographic paper inside the cardboard cameras. Exposure lengths of between 30 seconds and 5 minutes create unique negative images. The negatives are exhibited in tray frames. The prints are pinned into place using the pin holes created when the photographic paper was pinned inside the camera. The visible pins and their corresponding shadows provide a traceable link to the hands-on photographic processes employed. 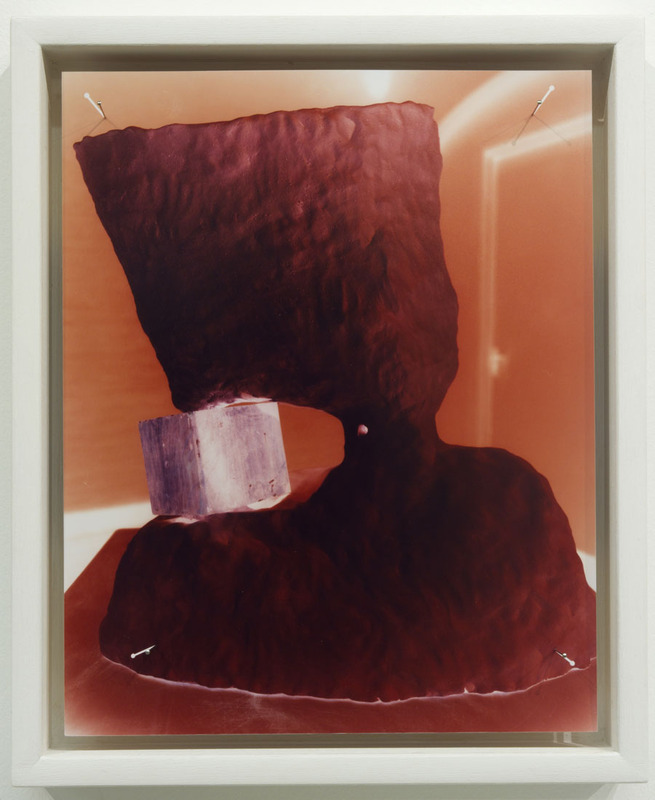 As well as emphasising the process by which the work was made the negative images draw attention to the material nature of the sculpture that has been photographed. 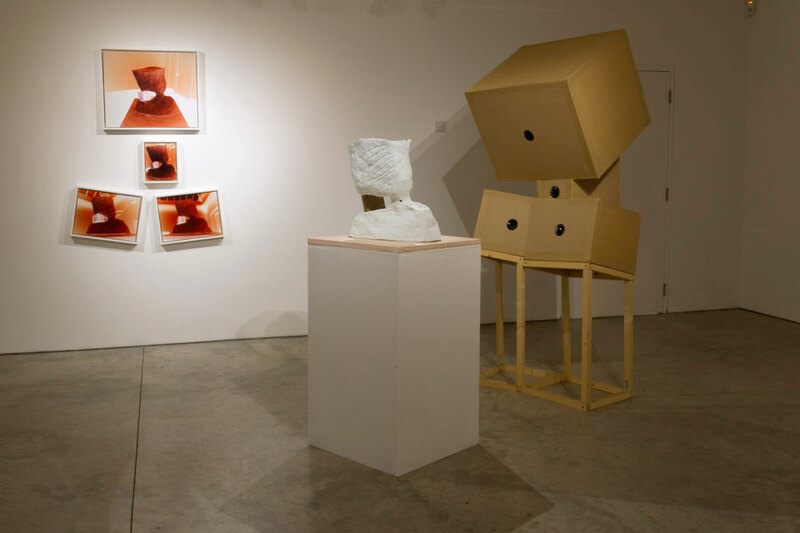 Each work has been carefully selected for its specific approach to sculptural processes. 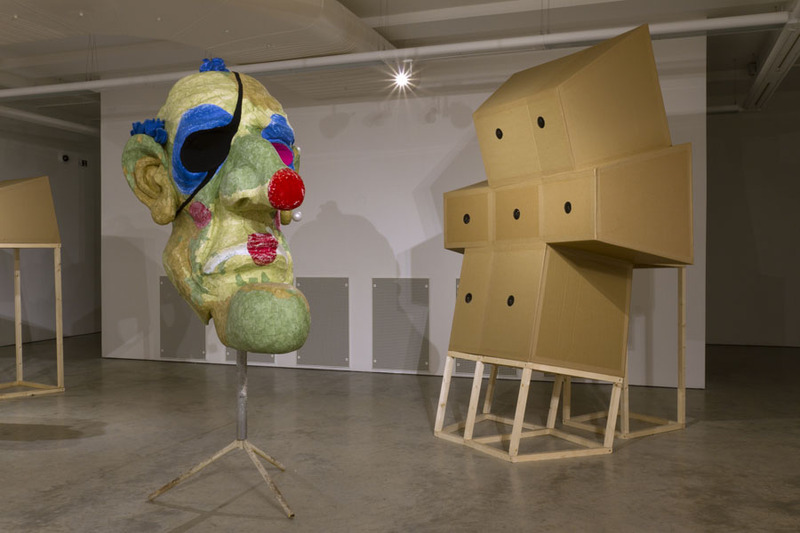 As with Martin Newth’s photographic explorations the visibility of the processes that the three sculptors have employed animates the works and represents a key aspect of how the sculptures might be understood. Installation at Gerald Moore Gallery showing Cool Speech, the camera and the 4 unique c-type colour photographs displayed in tray frames. 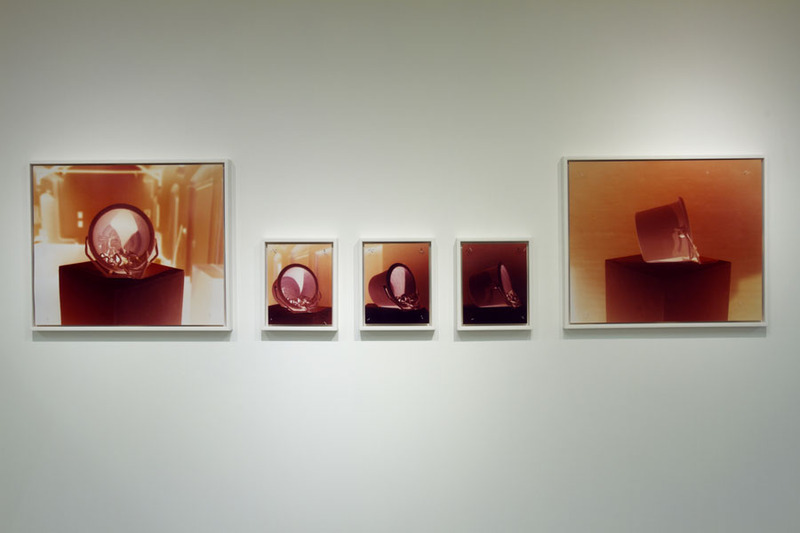 Installation shot at Gerald Moore Gallery showing 4 unique negative c-type photographs, tray frames and pins. Sizes: top: 20”x24”, middle: 10”x8”, bottom, both: 12”x16”. 2013. 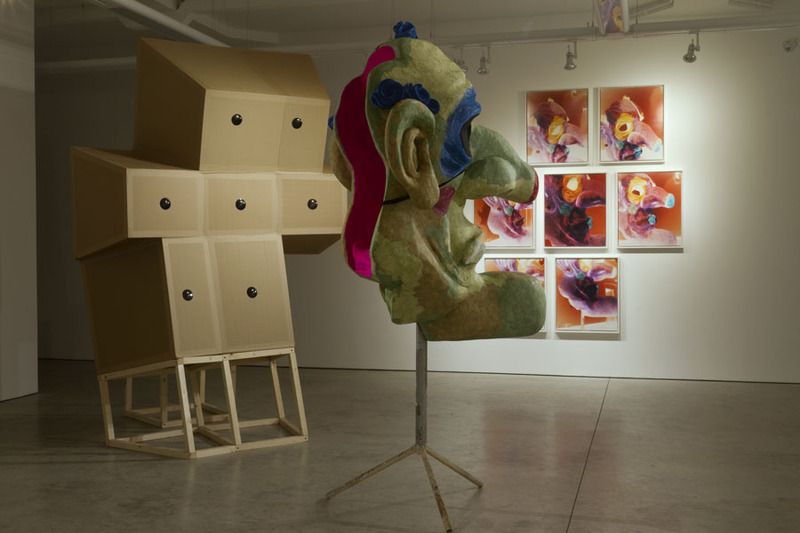 Installation shot at Gerald Moore Gallery showing The Player and its corresponding camera. Dimensions of cameras 2m40cm (h) x 1m90cm (w) x 1m80cm (d). 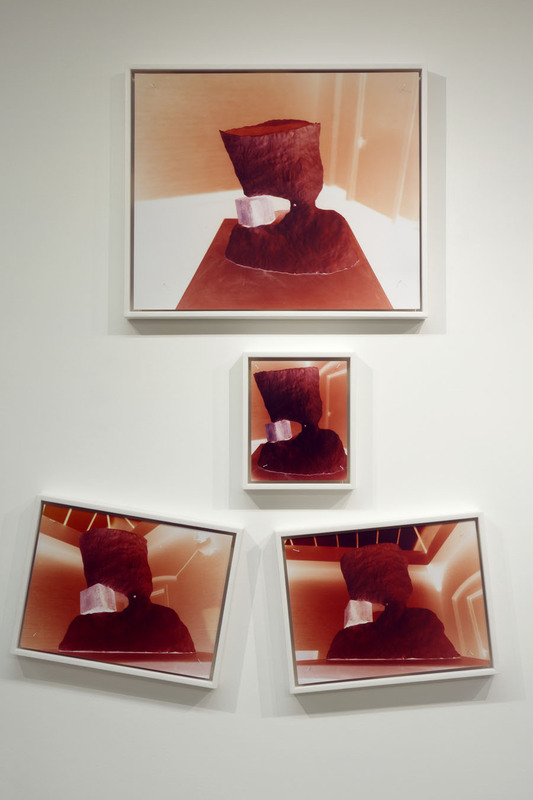 Installation shot at Gerald Moore Gallery showing The Player, its corresponding 7-lens camera and the unique colour c-type photographs installed behind. 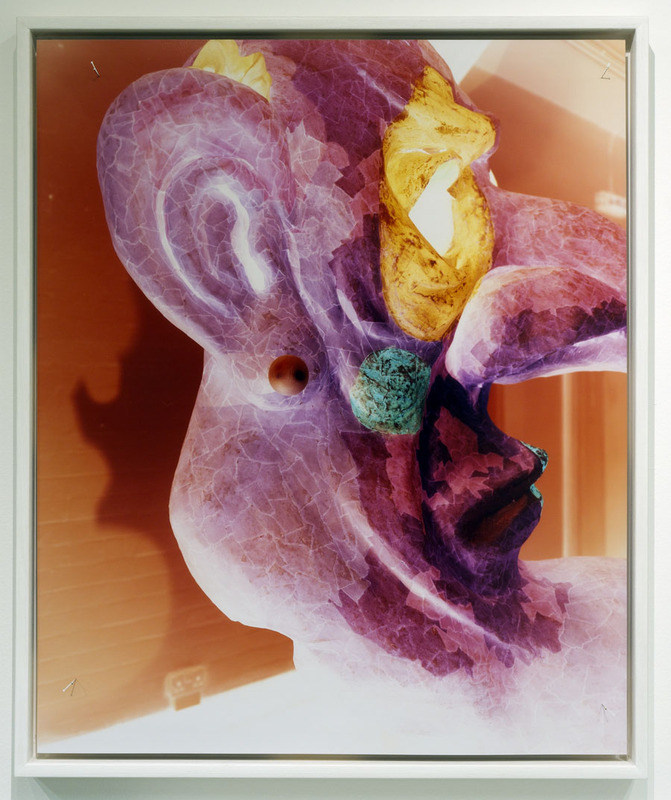 Detail of unique c-type colour negative image made of the The Player. The sculpture is made using carved polystyrene and a set makers’ papier mache-like process. Normally, a sculpture made for a theatrical set would be sanded to a smooth surface. Matt Franks leaves the surface deliberately un-sanded. In this way the process by which the sculpture is made becomes visible. The un-sanded squares of paper are made even more visible in the photographic negative image. And the gaudy, carnivalesque colours of the sculpture are seen in their inverted opposite. 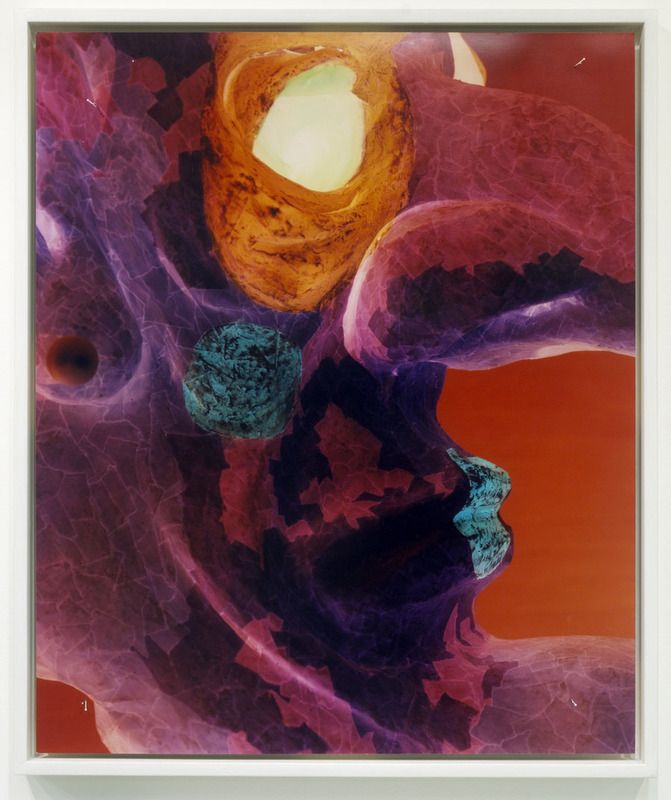 Detail of unique c-type colour negative image made of the The Player. 24”x20”. Installed in tray frame with pins. Plastic Paint Kettle, Rag and Trade Undercoat on plinth. 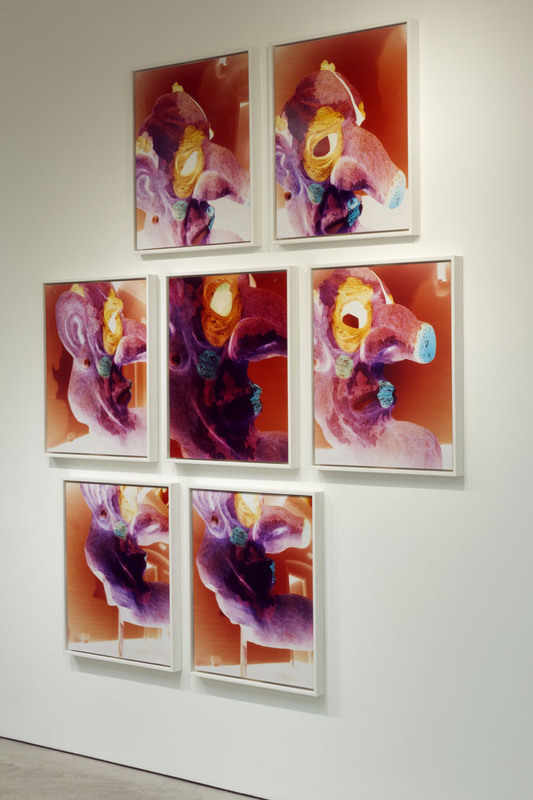 Installation shot at Gerald Moore Gallery of Inside and Out along with corresponding 5-lens camera and installed c-type colour negative photographs. 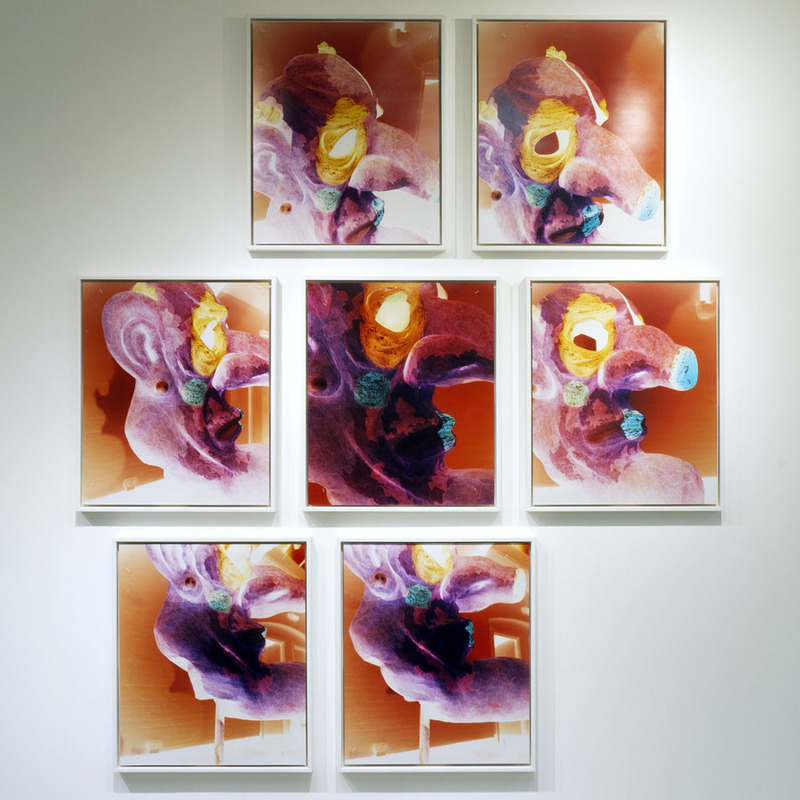 Installation shot of 5 unique c-type negative photographic images made from Inside and Out. Images are 20” x 24” and 10” x 8”. Installed in white tray frames with pins. Detail of unique c-type colour negative image made of the Inside and Out. 20”x24”. Installed in trayframe with pins. Detail of unique c-type colour negative image made of the Inside and Out. 10” x 8” Installed in trayframe with pins.